It's only since Afghanistan that Canadians as a people have become appreciative of what their military has done on their behalf. In past wars or UN missions, what soldiers endured largely went unnoticed at home. The fact that it gnaws at Dallaire indicates that he may not understand soldiering the way others do. It's perhaps understandable that retired Lt.Gen. (and now Senator) Romeo Dallaire would view the Oscar-nominated (2004) movie, Hotel Rwanda, as "junk," considering that Nick Nolte played him in a cartoonish and superficial way. In an interview with Huffington Post Canada, Sen. Dallaire said he had "promised never to let the Rwandan genocide die," but deplored the content of the Hotel Rwanda movie. Dallaire commanded UN troops in Rwanda when genocide occurred in 1994, and UN headquarters in New York ignored his warnings that it was about to happen. In his book, Shake Hands with the Devil, Dallaire noted that he was ill-prepared for Rwanda (his first and only field command), and knew little about Africa, He subsequently suffered from PTSD (post-traumatic stress disorder) and contemplated suicide due to the massacres that the UN let happen. I (and others) have always felt the mental anguish Dallaire endured was as much from having witnessed 10 Belgian paratroopers under his command being killed by a mob, and him not doing anything. It's every military commander's nightmare. Anyway, Dallaire has survived Rwanda. He was promoted and awarded medals, and made a senator on retirement. He is now a leading humanitarian voice on behalf of those facing genocide and against the use of child soldiers. 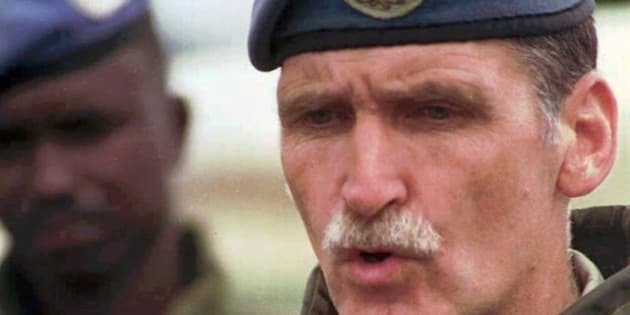 While he was the wrong man for Rwanda, few would argue that Romeo Dallaire is a good and decent man, who was probably in the wrong trade as a soldier -- even though he achieved high rank. Born in the Netherlands in 1946 (his father was a Canadian soldier), he graduated from RMC in 1970, served as an artillery officer, and prior to commanding the Rwanda UN mission, was commandant of College Militaire Royal de Saint-Jean. Dallaire wrote a curious forward to a 2007 book edited by Kevin Patterson and Jane Warren -- Outside the Wire -- which is a collection of writing by soldiers, doctors, journalists, and aid workers who've seen the war in Afghanistan. "The plight of Canadian soldiers," he writes, "is that they perform the most dangerous of their missions in far-flung lands and nobody back home... really feels the intrusion of war into the national psyche." This was the case at Vimy Ridge in WWI, the liberation of Holland in WWII, and outside the wire in Afghanistan in modern times: "Soldiers struggle with how to convey the realreality. Sometimes even with what is the real reality." Perhaps Sen. Dallaire is speaking for himself. Does he really think it is the "plight" of soldiers that they face danger in "far-flung lands"? Isn't that why they joined the army? The soldier's role is to enable those at home to live normal lives while they risk their lives overseas. It's only since Afghanistan that Canadians as a people have become aware and appreciative of what their military has done and is doing in their name, on their behalf. In past wars, or UN missions, what soldiers endured largely went unnoticed at home. That also applies to the navy and Air Force. This disinterest, or ignorance, is not so much a "plight" as a fact of life. The fact that it gnaws at Dallaire indicates that he may not understand soldiering the way others do. He talks of the "drug of combat... that has absolutely no equal in the human experience... no civilian equivalent where one's job is to offer up life and limb for a mission, a cause, a buddy, another human being..."
He feels that "forever burnt into the wiring of a combatant's brain is another (undefined) reality... no amount of time can dampen." This, surely, is Dallaire talking about himself -- the effect of Rwanda (and those 10 Belgian paratroopers) on his own psyche. And while he talks of "combat," Gen. Dallaire has really never been in combat. He's witnessed killings and the effects of massacres, but UN troops under his command in Rwanda were never ordered to fight back, were too few, and too scattered, to stop the slaughter of Tutsis by Hutus. As a commander, that has got to torture him. If one thinks for a moment, one realizes the police officers, fire fighters, rescue workers, and ordinary people put their lives at risk on behalf of others when occasion demands. Every day, there are news reports of someone doing something heroic to help someone else. Soldiers, police, and firefighters have made a deliberate choice to do risky jobs. Most are not mentally anguished by their experiences. When one looks back at what our soldiers endured in the trenches of WWI, the remarkable thing is that in photos they all seem inexplicably cheerful. The same with soldiers of WWII and Korea. Even in post-war peacekeeping missions, those who enlisted in the army didn't expect (or get) much thanks from their country. In his forward, Dallaire writes that soldiers returning from Afghanistan may feel "shock" at the "unseemly opulence of our country" and the "posturing of politicians," and the "security that envelopes civilians." Frankly, I doubt many soldiers are as shocked as Dallaire claims. Indeed, many Canadians became soldiers to preserve Canada's way of life. Maybe Romeo Dallaire was adversely affected, but his is an individual case and not applicable to everyone.